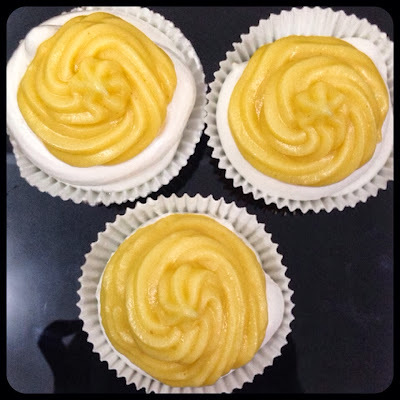 My Brazo de Mercedes Challenge | Mommy Joys | Marriage, Motherhood, Life. Back when I still lived with my mom and she was out, she'd always ask me what I wanted her to take home. 4 out of 5 of the time, I would tell her to bring me something saccharine for my sweet tooth. And 3 out of that 4, it would be an image of a cake in my mind's eye. Not just any cake, mind you. It was always specific. Nooo, it's not chocolate cake. It's Brazo de Mercedes, my super duper ultimate favorite! Here's the recipe I got from bakehappy.net, just in case you want to bake Brazo de Mercedes, too. 1. Pour condensed milk in a pan. 2. In a bowl, mix water and cornstarch. Add the mixture to the condensed milk and start heating up the pan. 3. Whisk in the egg yolks gradually while the pan is still not too hot. 4. Whisk continuously until very thick. The texture should be of piping consistency before you turn the burner off. 5. Set aside to cool down. 1. Beat the egg whites until foamy, then add the vanilla and cream of tartar. 2. Gradually add the sugar while beating the egg whites. Mix until stiff peaks form. 3. Pipe to prepared baking cups. Leave a hole at the center of each cup for the custard filling/topping (but don't pipe in the custard yet!). 4. Bake at 350 degrees F for 7 minutes, or until the top of the meringue turns slightly brown. After baking, set aside for a few minutes to let it cool. And there you have it - your Brazo cuppies! :) If you're not as bad as I am with egg whites, I bet this recipe will be easier for you. ;) Good luck!